In short, I highly recommend Edward Fudge’s new commentary on Hebrews. I have found it intellectually rigorous, exegetically responsible, theologically rich and pastorally sensitive. 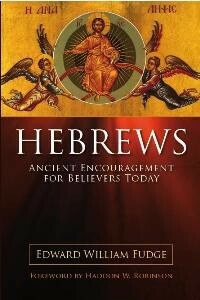 I review this book from the perspective of one who has taught Hebrews on numerous occasions in both academic and congregational settings. In my own ministry I have attempted to do what Fudge proposes to do in this book: to marry the head, the heart and the hands of the interpreter as well as those of his/her audience. That is, I, along with Fudge, propose to bring both intellectual rigor and spiritual vitality to the exegetical task. In Fudge’s language, this is a “bridge commentary” for the “serious Bible student who seeks scholarly content in non-technical terms” (p. 19). It is an attempt to do in print what all of us who are confessing Christian exegetes ought to do with our lives: to allow and foster and seek a dynamic relationship between the life of the mind and the life of faith. In this effort I congratulate him, because in my estimation he has done very well. The book is arranged in a straightforward and simple way. He has divided the text of Hebrews into 48 pericopae. This alone betrays careful thought and analysis of the letter and comparison of a vast amount of literature and commentaries (no two commentators divide Hebrews in quite the same way). Each pericopae forms the basis for a chapter of the book and contains a title, the text, a “Why and Wherefore” explanation and commentary proper under the subtitle “Unpacking the Text.” I find this arrangement most helpful and natural for thorough exegesis in narrative form such as Fudge proposes. As I read the thought occurred to me over and over again: Edward Fudge has not only studied Hebrews, he has taught Hebrews. The introductory chapter is brief and addresses only the most essential information preliminary to exegesis. Since many of the introductory matters concerning Hebrews are hypothetical, there is no real loss in Fudge’s brevity; it is adequate for the task at hand. His bibliography is substantial and reflects his wide reading across denominational and confessional lines. He has interacted with critical, mainstream Protestant, conservative and moderate evangelical as well as Catholic monographs and periodical literature. By my count there are 51 monographs, 83 articles and 25 other reference works. He has examined much of the relevant literature on Hebrews published in English this century. Of these there are 27 items from authors of Stone-Campbell persuasion. There are, however, some omissions of Churches of Christ scholarship from his bibliography: Burton Coffman, George DeHoff, E. M. Zerr are commentators widely read in Churches of Christ but not found here. Also of significance is R. H. Boll’s short monograph. Missing are the Annual Lesson Commentary notes on Hebrews, the 2006 Freed-Hardeman Lectures (particularly Jack Lewis’ and Kevin Youngblood’s chapters), and the Transforming Word Commentary just out from ACU Press. I read in detail his exegesis of these pericopae: 1.1-4; 4.14-16; 5.11-6.3; 6.4-12; 7.1-3 and 12.18-24. Fudge has provided for us a responsible historical-critical exegesis grounded in the language and structure of the text, sensitive to the social and rhetorical situation in life of the authors and recipients (as far as is known or hypothesized) and, furthermore, one that is pastorally sensitive in its application of the message of the text. Fudge examines well both what it meant for the original author and recipients and he attends to what this text means for Christians today. Where the text is ambiguous, Fudge trusts his readers enough to let them know such. When the text is open to a possible interpretations, Fudge fairly presents options in clear terms. Whether or not one agrees with specific points of interpretation, it will be clear that he is fair to the evidence and supports his conclusions with exegesis and theology. As I read, I noted that in those places where I disagreed I felt compelled to “search the Scriptures more diligently.” I am not at all surprised this book has received favorable reviews across a wide Christian spectrum. Fudge has done his homework and is fair to the evidence; he also has something to teach us, and does so with clarity, candor and earnest spiritual concern. I am pleased to recommend it; and I shall be pleased to use it as the Lord gives me opportunity to teach and preach from Hebrews in the future.